Friday was a great day in preparation for Shabbat! The banot started off the day with an ice cream party in celebration of one of their friend’s Hebrew birthday. Then they had an afternoon full of fun including basketball games, the kangaruach (Yavneh’s newest jumping trampoline), and s’chia klalit (free swim). The banim enjoyed an afternoon full of gaga and newcomb and cooled off in the agam. All of the chanichim dressed up for Shabbat and joined the rest of camp for a beautiful ReLeSh (Ruach Lifnei Shabbat.) After a ruach-filled Kabbalat Shabbat, we went to the chadar ochel for a delicious Shabbat meal. Everyone enjoyed the yummy soup, challah, chicken and potatoes. 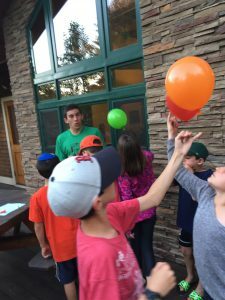 Following birkat hamazon, Gurim went to the bunks for a well-needed night of sleep. Saturday morning we davened Gurim Shacharit, ate breakfast, and joined the rest of camp for Musaf services. After that, the chanichim enjoyed their free time with friends around camp before the deli lunch buffet. Free time after lunch consisted of open agam time and a watermelon snack! The chanichim went back to the bunks for peulah k’kilah (community activity) with each of the bunks. Following the peulah, each of the tzrifim went to their sicha (learning during shabbat afternoon.) After sicha, the entire camp came together to hear stories from other madrichim and learn about the theme for camp this summer. Dinner was filled with zemiriot (songs) that led into Havdallah. We ended Shabbat with lots of dancing and singing, and went to bed to get a good night sleep for a full day at camp. Sunday started with a typical routine in morning, including breakfast, chug, kitah and instructional swim. After lunch, the chanichim headed back to the tzrifim with their Kerem (counselors in training) while their madrichim were in a staff meeting. In the afternoon, the banot had rikud and parachute games. The banim spent the afternoon with slip n’ slide and dodgeball. We all came together for a fun free swim full of swim floats, noodles, and snorkles. Peul0t erev was an all Gurim “Minute to Win it” between all the tzrifim. Some of the stations included cup stacking, sliding an oreo into your mouth from your forehead, and more! We ended the night with rad hayom. 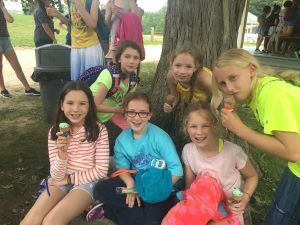 The past few days have been packed with activities and we can’t wait for the rest of the summer. Our next blog post will feature July 4th and our first trip day of the summer!